Of all the configurations that modern chamber music has to offer us, the unaccompanied string performance is one of the more esoteric. The solo violinist, for example, has the many resources of double stops, ways of articulating and resultant sound color at her or his disposal. It is often music that poses a challenge to the composer and the artist. Yet of course when all goes well it gives us very rewarding music. Yet one does not often encounter new music in this vein, as compared to, say, the string quartet or solo piano oeuvres. Violinist Hlif Sigurjonsdottir provides us with an absorbing unaccompanied program on her Dialogus, Music for Solo Violin (MSR Classics 1551). We are treated to six contemporary works by composers not well known to me. Lurking somewhere behind the scenes often enough is the spectre of J. S. Bach and his seminal works for unaccompanied violin. Not in terms of imitation but as a father figure and foundational presence. The music has a contemporary modern flair, to be sure, yet often enough there are Bachian roots in the way the melodic development freely unwinds, in the use of double stops to bring out harmonic implications, things like that. Now and then we get folkish strains that bring other traditions into the picture, so this is not monolithic in compositional intent. And every composer has his or her own distinctiveness so that the program maintains interest and generates appreciation throughout. The composers represented are Jonas Tomasson, Runa Ingimundar, Karolina Eiriksdottir, Hrodmar Ingi Sigurbjornsson, Alfred Felder and Merrill Clark. The various compositions date from 1983-2012. Each work enjoys its world premiere recording here. Many of the composers are Icelandic, as is Ms. Sigurjonsdottir, so we get a welcome chance to explore some very worthwhile music from a country we hear too little from in the releases available to us in general. Every work poses a interpretive puzzle that Ms. Sigurjonsdottir solves and realizes with poetic grace and, as needed, considerable technical abilities. She would seem the ideal medium of these works, all of which are substantially intricate in their compositional schemas without having the goal of showing off the violinist in a burst of virtuoso fireworks. The music in that way is pure melodic-structural depth, by no means easy to play but directed toward a purely musico-expressive result. Hlif gives us a detailed and beautiful reading of these works. Concentrated, focused and impressively linear and often contemplative, or alternately stirring. The more I listen to this one, the more I find to appreciate. The music does not set out gratuitously to please so much as it makes a cohesive, impactful impression that stays with you long after the performances are done. Very worthwhile music in peerless performance! Highly recommended. Kalevi Aho (b. 1949), a contemporary Finnish composer of note, is primarily known in international circles for his orchestral work, which to date includes 16 symphonies and 21 concertos. For a review of a CD of some of his concerted pieces see my September 24, 2014 post. On the program today we have his Works for Solo Piano (BIS 2106) as played by pianist Sonja Frakl. It covers a selection of works from 1965 through 1993. Of the earliest work, "Nineteen Preludes" (1965-68), all but #17 might have been written 100 years ago and not have sounded especially modern. They are expressively romantic and/or dance-like folkish, charming but except for the 17th, perhaps not yet signature in style except in a germinal sense. The "Three Small Piano Pieces" (1971) take the lyricism of the preludes and thicken it all with modern harmonic spice. Suddenly the seeds of the earlier material have blossomed into a more extravagently advanced and daring music, yet short to the point of pithiness. The "Two Easy Piano Pieces for Children" (1983) take that essentialist style and boil it down further to a simplified essence. With the "Sonatina for Piano" (1993), "Solo II" (1985) and the "Sonata for Piano" (1980) we get the fully mature, serious modern composer for the piano, with something at times of the dance-like strains we have heard in the Preludes but fully developed into a virtuoso and harmonically-melodically original modernism that perhaps as a taste of Prokofiev-Shostakovitch in its temperament and a dash of Hindemith too, but in terms of the expressionist and earthiness tang of its basic approach, gaining and retaining an original ground that ultimately advances the music in a furtherance that is personal and original. In the end we get a more tonally ambiguous palette that takes the music further into the later 20th century while retaining an expressionist ethos. These are the important works and we can appreciate the works leading up to them as preparatory and part of a continuous development. These later pieces generate genuine excitement in their virtuoso motor propulsion, their abstract but dense pointedness and alternatingly relative repose, contemplation, mystery. Sonia Frakl has the prodigious technical mastery and a genuine understanding of the extraordinary expressive, tumultuous abstraction of these difficult yet moving works. She shines brightly and gives us a rather thrilling take on the later works, yet she approaches the earlier works with an immediacy that works perfectly for what the composer intended. The three later works are monumental. The earlier works give us a developmental view and have much character. Taken together we get a thorough picture of Aho the writer for piano. It is a captivating voyage into the music of a master of our time. It is a good one to hear, surely. Ms. Frakl triumphs! The morning breaks sunnily here with a kindness that we all know could turn on us later in the week, but we trust in Mother Nature to give us these lovely spells and hope for the best. As it happens, I listen to an album that seems perfectly suited to a spring morning, or for that matter just about any morning. Johann Nepomuk Hummel (1778-1837), aside from having one of the more interesting middle names in the classical pantheon, happens to be one of my favorite lesser-known composers from the later classical-early romantic era. Certainly Mozart and Beethoven overshadowed just about everybody then, but nonetheless Hummel holds his own as a composer who is never mediocre, whose every work I have had the pleasure of hearing is filled with charm, craftsmanship and inspiration. The volume at hand Piano Trios 2 (Naxos 8.573261) is no exception. It covers the Trios Nos. 1, 4 and 5. The Gould Trio have genuine class and dash in their performances, giving the music a tender sweetness and a more brusque brio depending on the movement. They always seem to capture the essence with brilliance. From the very classically Viennese No. 1 to the more evolved concerted "Grand Trio Concertante" of the No. 5, we get a wonderfully inventive Hummel, early and later, 1803 to 1819. I can scarcely imagine that anybody who cherishes this era of classical music would not appreciate this music and its fine performance. It is a breath of pure air. The Gould Piano Trio are real talents who rise to this music with enthusiasm and expressive clarity. A big bravo for this one! Mario Castelnuovo-Tedesco (1895-1968) was a key member, after Respighi, of the renaissance of Italian instrumental music in the 20th century which took place following a period of a dominance of vocal music, especially opera. He shares this distinction as a later arrival from the first generation of essentially modern-oriented composers which included Pizzetti, Casella and Malipiero. His music stands on its own among this group. The guitar works he wrote have become mainstays in that repertoire, but his violin concertos too have made their mark, to greater or lesser degrees. Today's recording features the two of them, the lesser known "Concerto Italiano" from 1924, and the more familiar "Violin Concerto No. 2, 'The Prophet'" from 1931. Heifetz played both in his day and now we hear fresh new versions by Tianwa Yang and the SWR Sinfonieorchester Baden-Baden und Freiberg under Pieter-Jelle de Boer (Naxos 8.573135). The "Concerto Italiano" enjoys its premier recording here. The performances leave nothing to be desired. Both works have considerable thematic interest and a grand sweeping tonality that is post-romantic perhaps, but filled with expressiveness. Tianwa Yang has a beautifully heroic, lyric tone and handles the sometimes difficult solo parts with world-class adroitness. 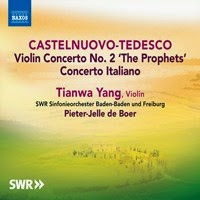 The second concerto is distinguished by incorporating Semitic-rooted melodic material (Castelnuovo-Tedesco's father was Jewish) and the influence is well-integrated into the composer's deft orchestral and solo violin writing. The "Concerto Italiano" is no less impressive for its wealth of eloquent craftsmanship. Both works get near ideal performances. With the Naxos price this volume is hard to resist. It is a very worthy way to get to know Castelnuovo-Tedesco if you have not heard much of his music. And it will ring true with those who already know him well. An essential volume for those seeking to explore the 20th century Italian renaissance and some fabulous music in its own right. Very recommended. An English composer with a pronounced lyrical gift, Howard Blake (b. 1938) is perhaps best known for his soundtrack to the feature cartoon, "The Snowman," which has a hauntingly beautiful refrain "Walking in the Air" for boy soprano and orchestra. He has a body of more "serious" works though, and we can hear some of how that sounds on a new recording featuring works for cello and piano, Diversions (SWR2/Genuin 15346). Benedict Kloeckner takes on the cello role for these works and sounds terrific. Howard Blake himself handles the piano part with dramatic credibility. These are modern lyric pieces that show us Blake the gritty but mellifluous contemporary composer in a series of six compositions, all but one enjoying world premier recordings in the versions presented. This is music of a pronounced tonality but without anything in the way of a neo-classical glance at the past. He may certainly have something of the romantic in him, but like Samuel Barber it is so individual that you don't find yourself saying, "yes, that is Brahmsian...that is Mendelssohnian, etc." 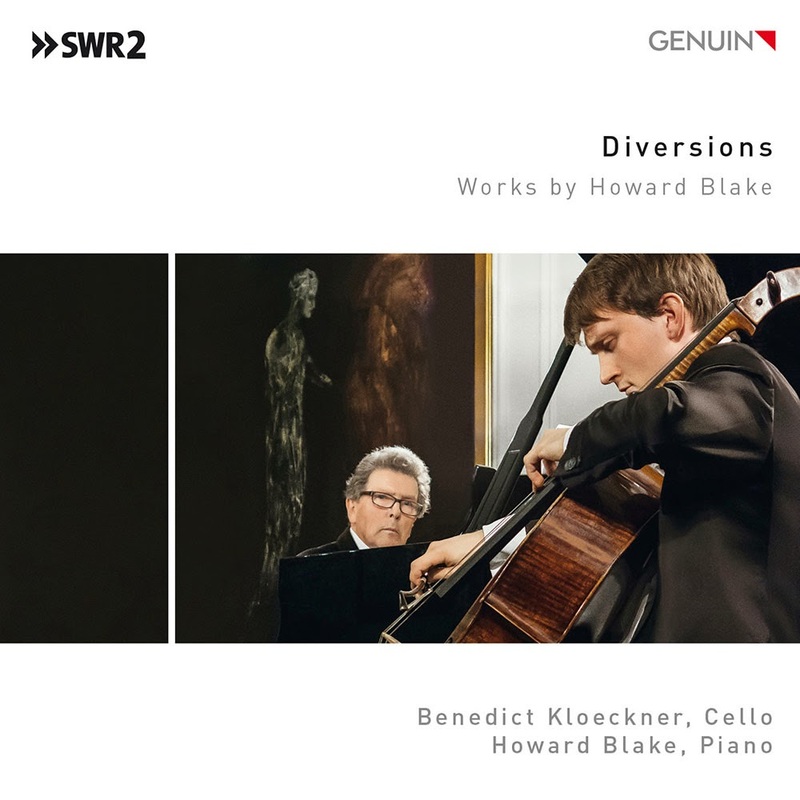 The works hold their own as contemporary music with a pronounced Blakean signature affixed. There is nothing banally "new age" sounding to them either. The music is filled with inventive flourishes that evince a fertile creative mind at work. The piano parts occasionally step into the spotlight but mostly this is music that gives the cellist a chance to take a singing melodic lead. Kloeckner responds with an extraordinarily vibrant tone and rhapsodic lucidity. There is nothing in the way of filler. Each work has something to say. We get a touching rendition of "Walking in the Air" that reminds us how well-constructed the deceptively straightforward song is. But then we get more complexly lyrical works in the title work "Diversions for Cello & Piano," in "Pennillion for Cello & Piano," the "Cello Sonata," and "The Enchantment of Venus." The program concludes with a short and very lovely "Archangel's Lullaby" and we are done. This is music any classical Anglophile will appreciate. It has an accessibility that will appeal to a large audience, potentially. And it is rousingly good music. It is not high modernist but it is thoroughly contemporary. It has a special quality to it that belongs very much to the musical personality of Howard Blake. Stateside composer George Rochberg (1918-2005) was one of the first prominent serialists to abandon the imposed rigor of high modernism when he suffered the death of his son in 1964. From that point on his music turned back to a modern tonality, using baroque, romantic and original means to craft an equally personal style. It is music from the later period we hear in his Complete Flute Music 1 (Naxos 8.559776), the first in a series of volumes featuring flautist Christina Jennings in the spotlight role. Christina is not only a flautist of great technical and artistic ability, she also is the daughter of Andrew Jennings, the second violinist of the celebrated Concord String Quartet, who rehearsed Rochberg String Quartets in the Jennings home as she grew up. So Rochberg's music was something she absorbed at an early age. The sympathy she early-on gained comes through nicely in her performance here of three very evocative works. "Caprice Variations" is a series of 20 freely treated variations on the well-known Paganini theme, originally written for solo violin. Ms. Jennings has transcribed 20 of them for the solo flute, with the principal theme stated at the end. It all sounds perfectly suited for flute and Ms. Jennings projects the various melodic moods with a beautiful tone and lively phrasing that seems quite right. There are times when her virtuosity seems virtually unparalleled in this performance. Bravo! 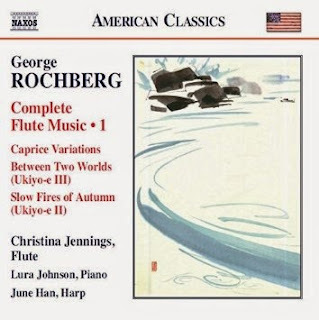 What follows are two works in Rochberg's "Ukiyo-e" series, Number 3, "Between Two Worlds, Five Images for Flute and Piano" (1982) and Number 2, "Slow Fires of Autumn, for Flute and Harp" (1979). Lura Johnson takes on the piano role in Number 3, which is marked by a modern expressivity that has a palpable relation to shakuhachi music from Japan, only transformed into Rochberg's own idiom. The same might be said also of Number 2, which is distinguished by some very effective scoring for harp, which sounds almost koto-like. June Han does a fine job with the harp part. This work has the shimmer of impressionism, with a clear lineage going back to Debussy and Ravel, but with a pronounced traditional Japanese influence and a special Rochbergian twist as well. For these two wonderfully poetic "Ukiyo-e" works, excellently performed and very much Rochberg at his best, it is worth the price of admission alone. But then you get the engaging "Caprice Variations" as a very pleasurable bonus. Christina Jennings soars with wondrous performances that satisfy, and Johnson and Han sound perfect in their parts as well. It is vintage later Rochberg, music that is accessible to all listeners who make the effort, but a welcome addition to those who already appreciate Rochberg and his version of later modernism. It is a winner! When it comes to vocal ensemble and choral music, the contemporary music world seems to offer less of it these days, as compared with chamber and orchestral works. That is my impression. Why that is I do not know, but when the music presents itself I tend to pay attention. A nicely put-together volume of modern contemporary works for voice can be had in Gregory W. Brown's Moonstrung Air (Navona 5989). It features six works performed variously by three top-tier groups, the larger choral ensemble The Crossing, conducted by Donald Nally, the mid-sized "Spring" Ensemble with Eric Dudley, and the vocal quartet New York Polyphony. The first and last ensembles have been critically acclaimed for their previous recordings; the middle group would appear to be specially formed for Brown's "Spring" but sound very good as well. 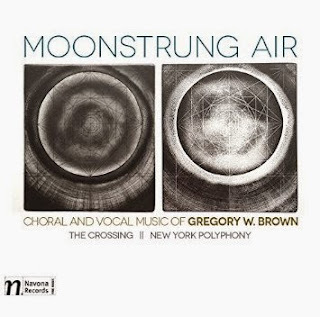 Gregory W. Brown's vocal music has a good bit of the influence of early polyphony and folk-archaic strains, but reshaped to his own personality, with the tang of the modern to remind you that this is music of today. This is not music that follows strictly or consistently the pre-Palestrinian or Palestrinian rules of counterpoint yet has beautifully fashioned part writing that evinces some of the aura of earlier times. The "Missa Charles Darwin" performed by New York Polyphony and the "Vidi Aquam" by the Crossing are high points in the early-in-the-late mode, very convincingly wrought. "Three American Folk Hymns" makes use of old American vernacular and shape-note hymns redone with real charm. "Entrai, Pastores, Entrai" is based on an old Portuguese Christmas carol. "Spring" has as its text a translation of an Ancient Greek text by Anacreon. "Five Women Bathing in Moonlight" sets the poetry of Richard Wilbur, depicting a seaside excursion in the 1940s. The performances are exemplary, the sound excellent and the compositions show us that Gregory W. Brown takes to vocal writing as a natural. The music has eloquence, verve and old-in-new panache. I find the music uniformly delightful. It will appeal to those who respond to contemporary choral music and no doubt also to those who might prefer early music. There is enough to thoroughly engage and please both camps, and those in the middle. Very enjoyable and nicely done! As I noted last April 2, 2014 (see that post), Borut Krzisnik composes music that is winningly biting and brusque, brutal in engaging ways. It is true of the last one, Stories from Magatrea, and it is true, perhaps even more so, of his latest Valse Brutal (Claudio Contemporary 6006-2). He is relatively young (b. 1961), apparently hails from Slovenia, and is very talented. 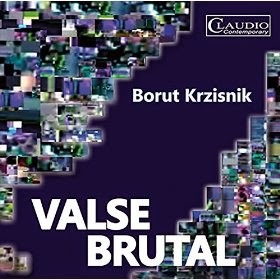 Valse Brutal includes seven interrelated movements/pieces that convincingly create a virtual orchestra from extensive orchestral samples. What makes it all work well sonically is the widely diverse orchestral sound excerpts of strings and other instruments playing expressively in both conventional and unconventional ways, things that live orchestras are called upon to do in avant orchestral settings today. The music is a sort of equivalent of "Guernica" and "The Rites of Spring"--it is dealing with the absurdity of war and tends rightly to have a savage quality to it. But it sounds not like Stravinsky or anyone else in its purely musical aspects, though their are prominent rhythmic tendencies that are in the forefront much of the time--in no way, though, derived from the "Rites," but rather parallel to it in its originality. Instead we get ultra-modern, ultra-expressive music that belongs to the present in its fundamentally new quality but hearkens back to expressive high-modernism in its feeling. There is a poignancy to the music, a real beauty in its bleakness that I find irresistible. And in a moment you forget that this is a virtual orchestra because the phrasing is so convincing. And the music marks a composer of, dare I say, brilliant invention and imagination. Anyone who seeks the cutting-edge in modern orchestral music today should listen to this one, preferably more than once. If you have the cash to buy it, by all means I recommend you do. Startlingly excellent! Anyone who took classical piano lessons for any length of time sooner or later tackled some of the technically oriented exercises of Carl Czerny (1791-1857). These are cornerstone pedagogical staples and have been for a long time. Yet during his life Carl Czerny was as much known for his formal compositions. With time the latter have largely gone unperformed for many years and are all-but-forgotten these days. Yet there are from time-to-time recordings available that show what he could do, and it can make for pretty impressive listening. 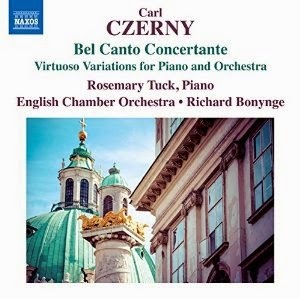 Today's compilation of "Virtuoso Variations for Piano and Orchestra," Bel Canto Concertante (Naxos 8.573254) gives you a good 70 minutes of works that Czerny himself classified under "brilliant pieces for concerts," as opposed to his more "serious works." And indeed, these sparkle with dazzling piano parts, have much to offer in the way of accessibility, but do not go out of their way to go beyond charm. All four concerted pieces included in the album are variations on a particularly well-received opera of the day, Bellini's "Norma," Auber's "Fra Divolo," Bellini's "Il Pirata," and Pacini's "Gli Arabi nelle Gallie." These were operas whose principal melodies were, one presumes, familiar to most in the audience (imagine that today with a contemporary opera?) and Czerny's goal was to write a series of bright and bubbling variations that would be likely to please concertgoers. For this recording the exuberantly virtuoso piano parts are quite nicely performed by Rosemary Tuck. The venerable English Chamber Orchestra under Richard Bonynge ably and enthusiastically provide the orchestra backdrop. In the end this music does not convince us that Czerny's modern neglect is unjustified. For that there are compositions on the serious side. What this album gives us is a lighthearted, skin-deep beauty that now seems naive and perhaps can endear because of that. It is a thoroughly delightful and beautifully performed late-classical/early-romantic repast of musical bon bons and hot chocolate. It is not music that stands out as seminal or even very important, yet it has charms and gives you a refreshing sort of palate-cleansing in between more substantial musical courses. When you think of Leonard Bernstein, you do not usually think of the piano, yet there is where he started, and those familiar with his music will recall that his "Symphony No. 2, The Age of Anxiety" has a prominent piano part. He left behind when he passed a number of compositions for solo piano, many written in his early period. Thirteen Anniversaries (Naxos 8.559756) gives us an excellent sample of his output in this realm, with three works written in 1937-38, one in 1943, and the title suite, which he set down in final form in 1988, just two years before his death. Alexandre Dussin handles the performance duties on piano, and he does so with a near-perfect understanding of the stylistic worlds they dwell in. He seems very much the right pianist for this music. The program begins with the very memorable "Sonata for the Piano" (1938), a work that has a modern flair and some definite jazz feeling at times. It is an excellent work, an initial flourishing of that special brilliance of Bernstein that incorporates elements of the zeitgeist without sounding at all eclectic. 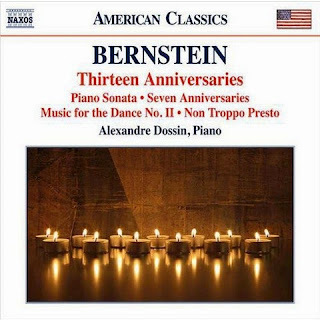 From there we encounter the two varied and fascinating sets of miniatures Bernstein wrote for friends and colleagues, the "Seven Anniversaries" (1943) and the title track, "Thirteen Anniversaries" (1988). These are rather brilliant sketches that show Bernstein's great feel for the piano and an individual approach that nonetheless draws on the influence of some of the century's great piano composers. The movement "For Jessica Fleischmann" some will recognize as a principal theme from the ballet "Dybbuk." But otherwise this is music we have not heard much, perhaps most of us not at all. The final two brief works, "Music for the Dance II" (1938) and "Non Troppo Presto" (1937) enjoy their first recordings. They add to the already excellent program. In the end anyone who appreciates Bernstein the composer will find in this music a more intimate side of his music. Anyone interesting in the modern 20th century oeuvre will also be intrigued and pleased with this, I would think. It adds a very worthwhile dimension to our understanding of Bernstein and has a greatly pleasing quality in itself, irrespective of its place in the scheme of things. Electronic Music arose in response to the advent of the tape recorder, which made it feasible to juxtapose and edit disparate sounds and transform them via various processing techniques. Tape splicing, electronic oscillators, the rise of increasingly sophisticated sound filtering devices and of course the coming of the synthesizer led to a body of works that reinforced modernism's belief in science and technology as a means to project us into the world of the future. And the music also reflected the modernist agenda of increased sound color and, eventually, the Serialist development of increasingly complex rhythmic appearances of a wide range of pitches, registers and timbres in a pointillistic matrix. Perhaps the peak of the initial phase of electronic music was reached with Stockhausen's monumental "Hymnen" a long work whose main source material was the national anthems of every country on the planet. Sometime in the early-ish '70s of last century electronic music ceased to be given the public attention it had and composers tended to go underground, though much of the innovations especially via synthesizers entered into pop, rock, r&b, rap and other mainstream musics where it remains today. The millenium and the rise of digital production has given Electronic Music a new life, and we can hear new composers and new compositions more readily and more abundantly these days if we look for it. A good example is an anthology of new electronic music in two volumes. Today we tackle Electronic Masters, Vol. 1 (ablaze 00011). 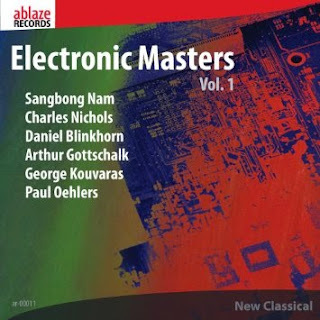 On it we are treated to six works by six new music electronic composers: Sangbong Nam, Charles Nichols, Daniel Blinkhorn, Arthur Gottschalk, George Kouvaras and Paul Oehlers. The compositions make much use of musical instruments, voice and natural sound as their source materials and something less of "pure" electronic sound. There is a tendency to work with particular sound types in any given work, less of the kitchen sink, everything together sort of collages or the bleep-and-bloop scatter sounds of the high modern era. The music tends to use the natural sounds in varying degrees of electronic processing, so that often enough one recognizes the source sounds for what they are along with their processed variants. There can be ambiance, orchestral densities or chamber intimacies. The anthology does not introduce much in the way of the noise-oriented composers. The works represented here tend to have pitch as a constant, with unpitched, noisier elements present at times but never thoroughgoingly out-front in the extreme way of some of the more ascerbic, astringent-oriented practitioners out there these days. Daniel Blinkhorn perhaps is the exception, but his "Anthozoa" has lots of pitched implications and does not jar us with the more noisy sorts of noise of the fringe. For all that these are not representing the extreme avant electronic composers so much as those who work in the new music middle-ground. Of course that is fine. The resultant mix of works segues well. It all gives you a vivid and rewarding listen to some accomplished sound poets who show us part of the state-of-the-art in Electronic Music today. What else that is not covered here is the increasing growth of live electronic music. No matter, since that is something that has over time formed an almost a separate substyle and a single volume of an anthology cannot properly cover all that as well. So perhaps it is best to leave that aside for another anthology in future. As it is there is a wealth of musical sounds here to digest, all representing an evolution of the "classic" electronic studio work. It is an adventure in new sounds, varied, contemporary and well-wrought regardless of the composer and work represented. Recommended! Afro-Americans who devote their careers to classical-modern classical seem rather rare in terms of what I have been exposed to of late. It seems to me that there should be more and perhaps I am not exposed to them. In the 20th and this century we have had our share of composers of note, some wonderful opera stars, but instrumental soloists of stature sadly I have been exposed to rather few. Perhaps it is a vagaries of chance that has made me miss some, but I cannot be sure. 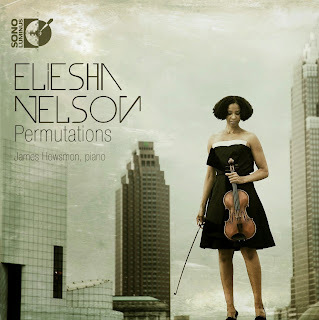 An exception today most certainly can be found in violist Eliesha Nelson, whose viola and piano recital Permutations (Sono Luminus 92186) is just out. James Howsmon accompanies her quite ably as they embark on some pretty spectacular performances of five American or Americana-related compositions in a modern vein. Some of the composers will be familiar to many readers, others perhaps not. All give us a varied and interesting program that Eliesha dives into with virtuoso fire and elan. Ross Lee Finney (1906-1997) is from an earlier generation of modernists. His "Second Sonata for Viola and Piano" performed well here reminds us that his rhythmically lively and melodically vital music still sounds well, especially in the hands of Ms. Nelson. Jeffrey Mumford (b. 1955) provides a brief work, "Wending," scored for unaccompanied viola with an intricate and starkly beautiful sound that employs multi-stops and open string harmonies that flesh out the very fluid melody line. Ms. Nelson makes of it a smoothly articulate wholeness in a most beautiful way. George Walker (b. 1922) has been one of the most brilliant Afro-American composers in our world and his "Sonata for Viola and Piano" gives us some memorable music that exemplifies why. There is a poignant modern lyrical side of him here, which grows into some rhythmically propulsive music well conceived and performed with an intelligent zest, then blossoms in the second movement with a searching, yearning passion that is unsentimental and thoroughly advanced in its edgy tonality. Russian Nikolai Kapustin (b. 1937) gives us a lively jazz inflected "Sonata for Viola and Piano" which ingeniously combines old jazz and new into a thoroughly modern classical framework. This is most certainly a work Ms. Nelson dives into with exciting drive, a precise but very incandescent attack. It is the sort of music where composer and soloist bring much to the sound and meet for a superb result. There is a vital liveliness that is most exhilarating to hear. The final movement is especially fine, almost ferocious in its soulful post-stride tumultuousness. Ms. Nelson and Mr. Howson give it a real spin! Finally John McLaughlin Williams contributes his "Two Pieces for Viola Solo." He is a celebrated figure of late as conductor and musical director, winning several Grammy Awards, but shows us here a more intimate chamber personality. The music is rather haunting and comes across with real beauty and expressive elation in Ms. Nelson's hands. 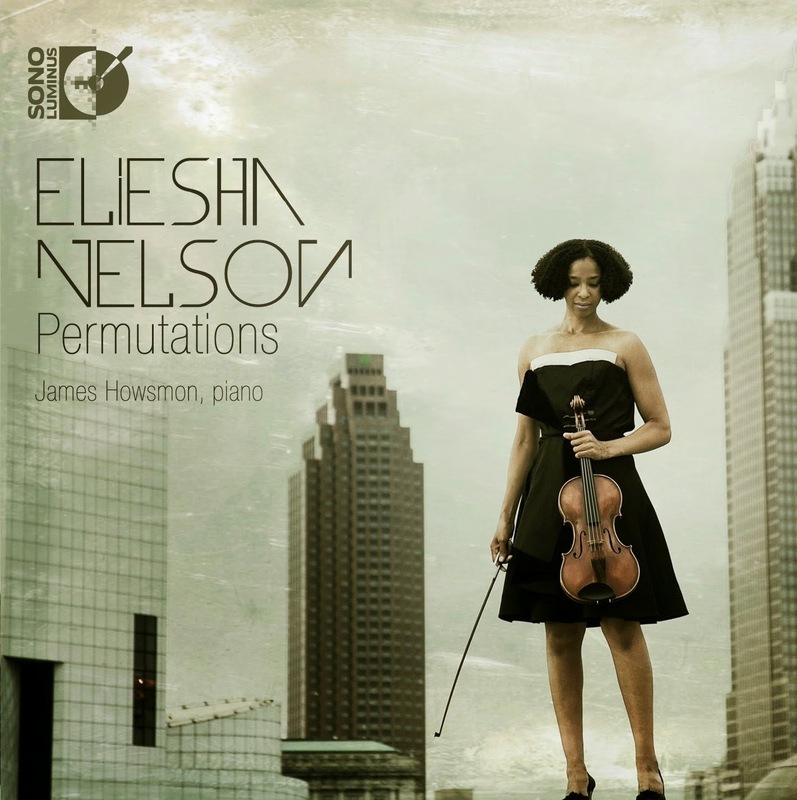 Throughout James Howsmon is impeccable and matches Ms. Nelson phrase-for-phrase in his well-thought-out wholistic approach to each of the piano parts. Eliesha has a beautifully hard-edged tone which has more in common with the violin of Joseph Szigeti than Joshua Heifetz; she evinces great character and power more so than sweetness and rhapsodism. The repertoire here is just right for her characteristic tone personality and it all very much comes across with excitement and strength. This is vital music. Eliesha Nelson is a vital artist. I am impressed and very pleased with this album. You with the contemporary in your blood will no doubt feel the same way! Oh I should mention that this release, like many of the Sono Luminus ones, comes as a regular CD and a 5:1 surround Blue Ray disk, all in one package. For the wealth of Baroque composers we can appreciate, a comparison of JS Bach and Henry Purcell is instructive for the vivid contrast their music presents to us. Where Bach can be profound, deeply contrapuntal and multi-lined in emphasis, Purcell is expressive, contrapuntal yet often emphasising a main melodic thread. Bach excels in the sacred and the serious, Purcell the secular and jubilant. This is a gross simplification, of course. But it tends to hold true. We can hear Henry Purcell at his best in this light on a recording of operatic music for the theater, The Indian Queen, performed beautifully by the Sixteen under Harry Christophers (Coro 16129). It is sandwiched between Purcell's brief preludish "Catch" for three vocalists and the concluding choral work by Daniel Purcell (1664-1717), "The Masque of Hymen." Daniel was either the younger brother or cousin of Henry and his music here is a nice bonus. The centerpiece work gets the emphasis and of course that's as it should be. 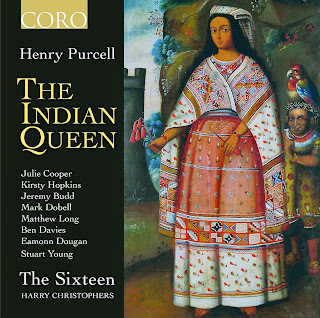 I am not as familiar with this work as I am of others by Purcell but it is a winning one and the Sixteen vocalists and instrumentalists give it all the spirit and dash it deserves. The music contains in plenty the memorability and zest we expect from such a Purcell work. Vocalists and instrumentalists excel and realize Christophers' high standards and period authenticity with enthusiasm and true artistry. It is delightful in every way! Any early music or general classicist needs a good dash of Purcell in her/his collection. This one is as essential as any. It's the Sixteen giving us another major triumph. Carl Vollrath comments in the liners to his Past Recollections, Music for Clarinet and Piano Vol. 1 (Navona 5988) that had he been born 10 or 20 years earlier he might have been considered a mainstream composer, but now he perhaps is "a Neo-Impressionist-pandiatonic-jazz-blues [stylist] with some folks elements thrown in the mix." For that reason the title Past Recollections seems apt to him. I do not disagree. This is music with a straightforward, well-worked directness. 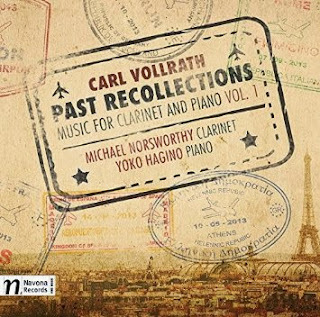 Michael Norsworthy on clarinet and Yoko Hagino on piano give us perfectly idiomatic performances of these 11 relatively short compositions, with the title track being a four-part suite. The quasi-pan-ethnicity of the music communicates with elegance and folkishness, the titles alluding to affinities with Copland, Poulenc, Prokofiev, Delius and Piazzolla. There is a straightforward lyricism at times, and a dance-like colloquial feel at others, but always a nicely unpretentious air of somewhat complicated simplicity. The melodiousness of the works seems perfectly fitted to the qualities of clarinet and piano. Clarinetist Norsworthy refers to them all as "character pieces," and surely the sort of clarinet writing we hear bears that out. Vollrath clearly takes to the instrument and its many sound qualities, carving out of ebony a sort of timeless personal yet somehow universal set of expressions. This is music that engages with a homespun beauty. It goes well with any season, but spring seems as good a time to hear it as any. In all a compendium of works that comes off with great success. It's a beauty! Not everyone composing today chooses to be a part of the advanced guard, of course. Some thrive in keeping traditions of the later tonal schools alive, finding their own way to make it new. Carson Cooman is one of the best and most prolific in this realm. There is so much of his music out I can't say I have been able to keep up, but a recent one has caught my ear and given me much to enjoy. 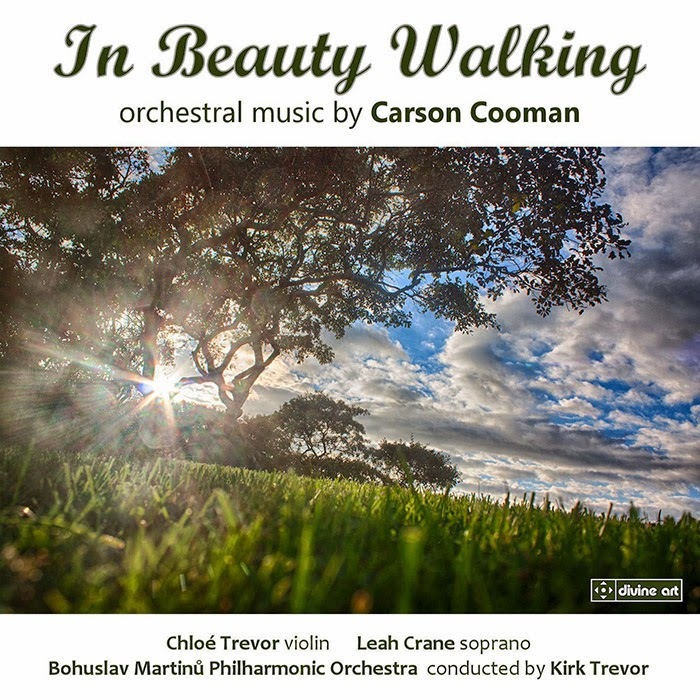 It is a compilation of four orchestral scores by Cooman, going by the name of the first composition presented in the program, In Beauty Walking (Divine Art 25117). On it the Bohuslav Philharmonic shine under conductor Kirk Trevor. These are four works that revel, as the title suggests, in the possibility of a sort of pastoral beauty, some with pronounced folk leanings, others less so. The "Symphony of Light" (2003) for string orchestra is especially ravishing. If Aaron Copland's Appalachian Spring brings you joy (as it does for me) Cooman here gives you some of that same feeling, albeit in his own way. His "Folk Fantasies" (2005/13) for violin, percussion and string orchestra continues the home-spun pastoral mood even more specifically with great rhapsodic charm. 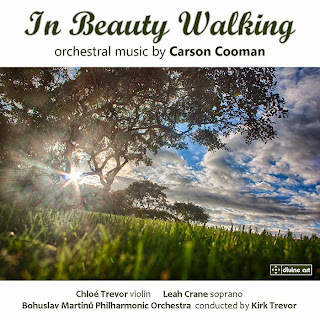 "In Beauty Walking" (2012) for soprano Leah Crane and orchestra has, understandably, a more song-like feel much of the time, with five short movements that capture the experiential joy of communing with the natural rural world, with music set to the poetry of Mary Austin. The last movement has a verve that brings the work to a stirring conclusion. "Sinfonia Concertante" (2013) for violin and string orchestra has a bit more of a neo-classical element. Chloe Trevor does a fine job as the violin soloist. Medieval and Renaissance influences get transformed to something once again beautifully tonal and very personal. One can hear something of the pastoral Hovhaness in parts of this music, in its lyrical treatment of archaicisms, though very much refashioned to a Cooman sensibility. So we have four Cooman works that dovetail well with one another, that express a sense of reverence and elation, of very real beauty. Cooman may be the most lyrical composer alive. He certainly moves to the center of such things on this program. It is in every way delightful. The music is impeccably conceived, orchestrated and performed here. Ravishing! Opera in new music echelons remains viable and most alive. Yet the expense of a production and the often conservative, museum-like attitude of opera goers are both sticking points that mean there are not as many operas created by new music composers than perhaps we might like. A wonderful exception is an opera by Gene Pritsker, newly available on CD, Manhattan in Charcoal (Composers Concordance 0021), with a poetic free-verse libretto by Jacob Miller. This is an opera with a stark, noir feel to it. It is set in the Village in the early days of this century. An artist meets a woman and they fall in love. She moves into his Village studio. Poverty, art, romantic entanglements and the art world at large enter into the picture against a backdrop of the streets of lower Manhattan. 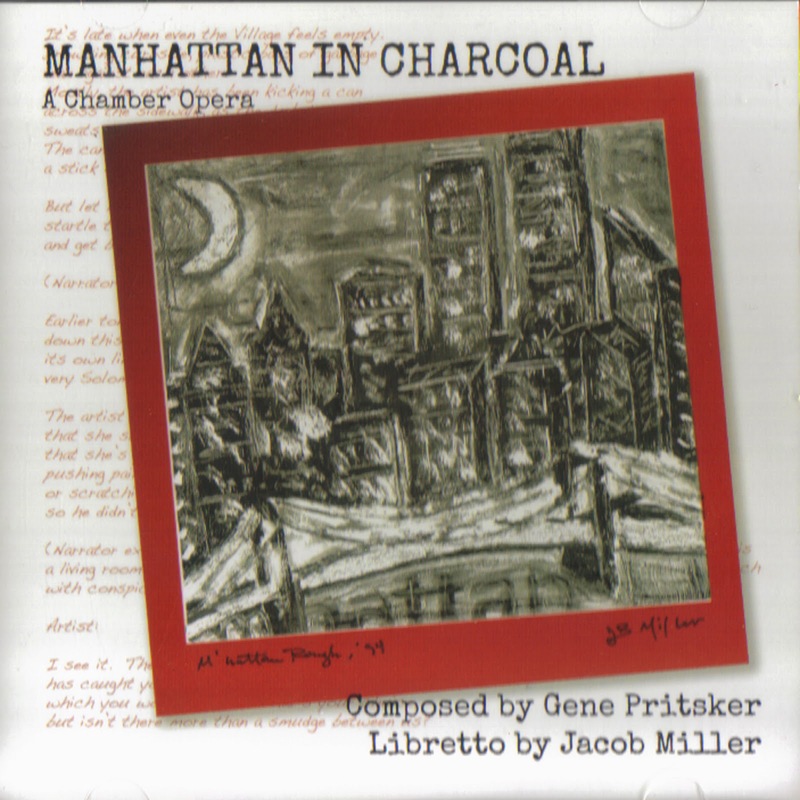 The opera centers around his 10 x 10 work on paper, "Manhattan in Charcoal" and its fate, which is linked in a very concrete way to the fate of the protagonists. A narrator introduces scenes and summarizes events that occur outside of the scenario. The artist and his Beatrice form the major characters, sung convincingly by Charles Coleman and Lynn Norris, with Jacob Miller taking on the role of narrator. There is a chorus that plays the parts of gallery owners and critics. A chamber orchestra forms an important part of the proceedings. Since the entire opera enfolds in around an hour, there is a terse compactness to the plot, enriched by vibrant imagery of the city in various moods. You get a series of scenes, moments in time lived by the protagonists, in an expressionist-modernist framework that is as vividly black and white as the central artwork. The libretto has a direct yet poetically astute quality. Pritsker's score pulls it all together with some excellent music in the Pritskerian style, modern and convincingly fashioned, adding jazz and rock elements subtly but effectively, filled with inventive music very well conceived and orchestrated. There are some mostly complex repetitions to be heard here and there; they do not qualify the music as minimalist but rather bring it a step beyond it. In all the music carries the day brilliantly. Pritsker has a natural ability to write music that is unselfconsciously original and absorbing in a way that resembles nobody else. It takes a few listens to fully appreciate it all. Once you acclimate yourself to the opera's mood and the complexities of the score you are left with a new work of real importance, a chamber opera that stands out as exemplary for our times. It's in its own way a triumph, an example of why Gene Pritsker is an outstandingly innovative voice on the current scene. Highly recommended! 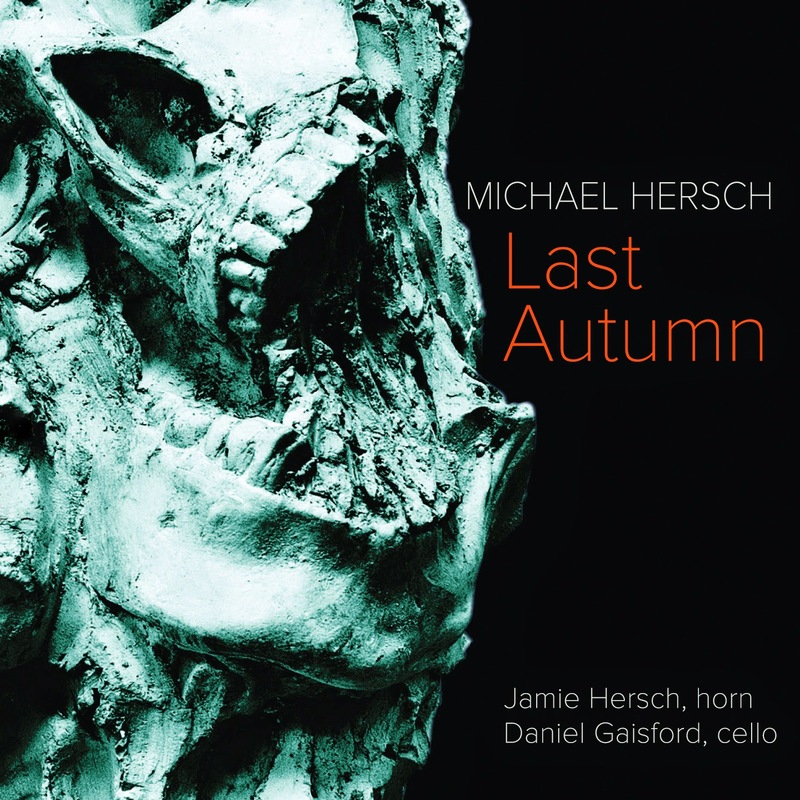 There are few living composers who equal Michael Hersch for his seemingly natural abilities. His music comes across as virtually effortless, extremely lucid and inventive, loquacious in the best sort of way. That doesn't mean that his compositions are in any way glib or off-hand. Quite the contrary. They are very serious, dramatic, and no doubt require a great deal of effort on Hersch's part to get to where they are. Yet they have a kind of natural, conversational brilliance that lays well. He began as a kind of wunderkind. Between the ages of 25 and 30 he garnered a rather amazing number of awards and grants: First Prize in the Concordia American Composer Awards, a Guggenheim Fellowship, recipient of the Rome Prize and the Berlin Prize, the latter from the American Academy in Berlin. At the same time his early orchestral works were performed and acclaimed worldwide. His 30s were marked by a pronounced shift from orchestral to chamber music. This blog has reviewed two remarkable recordings of works from the later period (type his name in the search box above for these). Now we get the chance to hear another such work, Last Autumn (Innova 907, 2-CDs), completed in 2008. It is a very ambitious, long and you might say heroic work for the unusual pairing of horn and cello. The work fills two CDs. It touches on a contrasting set of moods and modes, from a brooding quietude, to exhilaration, to an almost brutal declamatory expressiveness. Jamie Hersch on horn and Daniel Gaisford on cello have the challenge to realize the full work on the CD set and they do so with the sort of Promethean effort that is so needed. They rise to the occasion with great success. An easy summary of the work's many twists and turns seems out of my grasp at the moment. The complexities of the music demand extended close listening and I have indeed given myself to that gladly, yet there is an originality that defies any sort of simple pat response. It is music that has an heroic expressiveness we are more accustomed to experience in an orchestral setting. The music has backward glances into the historical maelstrom of stylistic possibilities, from allusions to contrapuntal musics of long ago to the romantics and early moderns. In the end this is a new sort of high modernism that works inside and outside of tonality, does not eschew dissonance but also plays upon harmonic possibilities that have earlier roots. Perhaps paradoxically it's the juxtaposition of all sorts of classical worlds upon an ultra-expressive framework that gives the work a very original life of its own. There is nothing eclectic but rather something distinctively Herschian about it all in spite of allusions to other periods. I feel after hearing this work a good number of times that it is yet another landmark in what Michael Hersch represents to us today. He is beyond the wunderkind stage, surely. He manages to construct a long-from chamber work that, like some architectural masterpieces, obscures the structural support, the beams and joists that enable the graceful magnificence of the seen (heard) end result to hold together. There is an immediacy to the music, the expressiveness of beauty and brutality together, that belies the no doubt hard work that went into its making. What remains is a heroic individuality that in some ways perhaps hearkens back to romanticism in philosophy but comes at us with a fully modernist sound. Hersch's rather wide acceptance, unusual for such difficult music, may be due to the very human qualities of struggle, of storm and stress that you readily hear in the music. In any event Hersch continues to impress as one of the foremost compositional voices of our times. He succeeds so completely in what he sets out to do in part perhaps because the music expresses the multi-stranded uncertainties of our age, yet manages through sheer confrontation to surmount heroically the challenges imposed on all of us today. Or so it seems to me. In any event this is music on a very high plane. Perhaps a masterpiece. You cannot afford to miss it if you want to get a sense of where modernism is going. Today we have something a bit unusual. 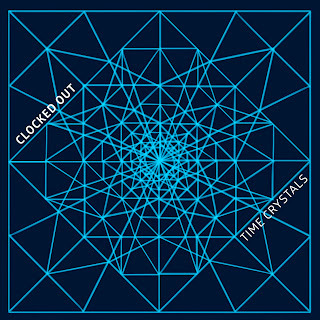 It is the duet of Erik Griswold on prepared piano and Vanessa Tomlinson on percussion, who go under the name Clocked Out. 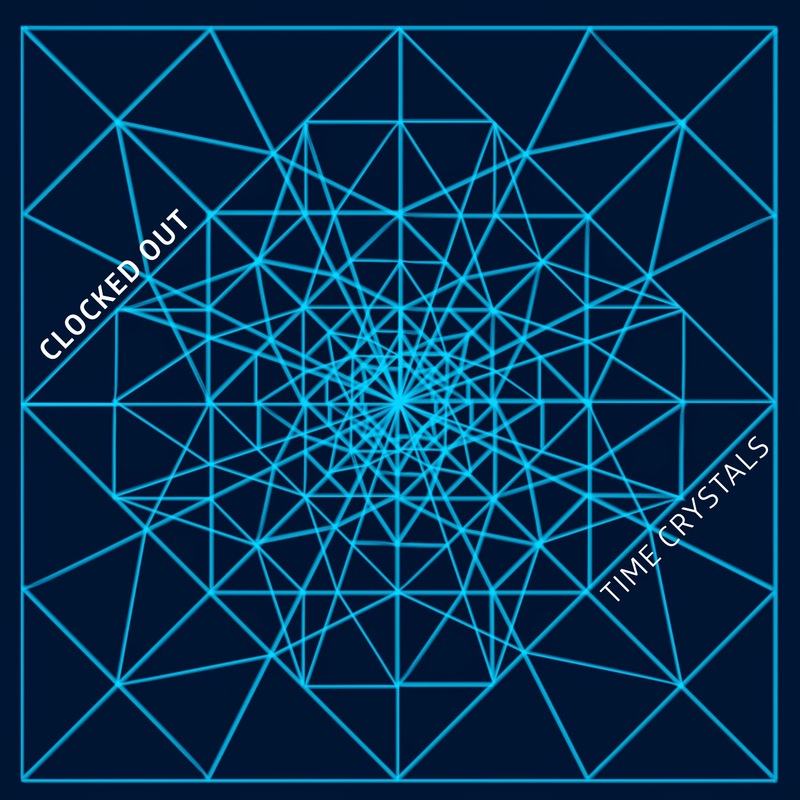 On their album Time Crystals (Innova 908) they engage in a series of 13 short Griswold compositions that represent in musical form physicist Frank Wilczek's idea of Time Crystals, which in the liner notes is defined as "perpetually moving structures that repeat periodically in the fourth dimension." Griswold on prepared-unprepared piano and Vanessa Tomlinson on all manner of mallets and other pitched and unpitched percussion explore rhythmic and sonic possibilities that can be ornate but deep-down have an immediacy, a homespun elemental quality. It all in part comes out of the tonality of their forebears Satie, Cage and a bit of ostinato that extends minimalism by going outside of its orbit, sometimes approaching the directness of rock without the heaviness. It is rather buoyant instead. Pentatonic and diatonic melodic forms are well represented here, with inventive yet very accessible sounds. The sometimes intricate two-voiced interplay between piano and percussion ever-shifts in intriguing ways. It is music serious but whimsical, folk-some and sometimes a bit ritualistic. It is charming music that should appeal to a wide spectrum of listeners, yet there is nothing tossed off about it so much as it develops ideas well, has its brief say and moves to the next number. By so doing it covers a good deal of ground while maintaining a stylistic consistency. This is music that is easy to like. If you want something refreshing, you can surely find it here. With a new week comes more new music, this time from a composer who grew up in the San Francisco Bay Area and reflects both American and international style possibilities. He is one Aleksander Sternfeld-Dunn. Fireworks (Navona 5997) is the name of the anthology devoted to his music. It sports a bright and varied program of chamber works plus one for orchestra and one for wind ensemble. What struck me first was the rhythmic vitality of the music. There are moments of quiescence and lyricism but also a robustly rhythmic dynamism that features interlocking parts and a harmonic-melodic openness that has both neo-classical and modern elements. "Joker's Wild" for orchestra begins the program with a flair and shows you the rhythmic qualities, exciting and dynamic in a direct sense. There is a hint of Stravinsky in his middle period, an influence that gets integrated in the overall style without the feeling of imitation. Chamber works combine ever-varied instrumentation, flute/piccolo and piano; trumpet, horn and trombone; flute/alto flute and clarinet; english horn and cello; alto saxophone and piano; and solo clarinet. His wind writing is idiomatic and colorful. When a piano part enters into a work the density and rhythmic qualities come to the fore. In the works that do not include a piano the music tends to be a bit more introspective and lyrically modern much of the time, but not exclusively. 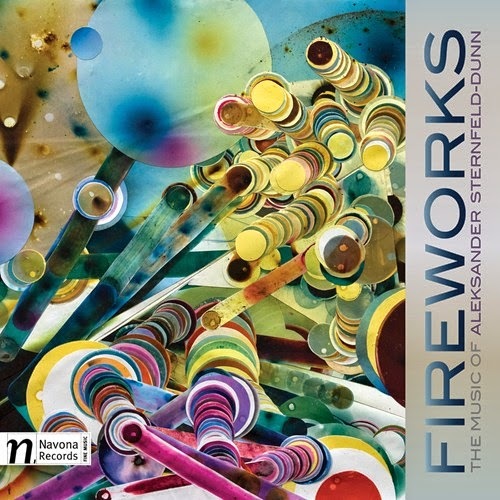 "Firecracker" for solo clarinet is a dynamic exception. The program finishes off with the title work, "Fireworks," a ten-minute extravaganza for wind ensemble. It is a rather brilliant piece of music, turbulent and dramatic, orchestrated with real skill and filled with exciting motor-impulse rhythm. In all we have a convincing program of well-wrought works that show a musical mind of originality and elan. Aleksander Sternfeld-Dunn shows us he is a force to contend with here. I look forward to more! The state-of-the-art as seen in the latest orchestral music of our time? Can we say something general about it? We can try. It tends to be dense, beyond minimalism. Perhaps there is a synthesis afoot between the new tonality and the lessons learned from the modernists? It depends of course on where you look. All that tends to apply to Michael Gordon on his latest album. It features two new orchestral works and is titled after the first, Dystopia (Cantaloupe 21105). Both works in their own way partake of the largesse of the grand symphonic tradition in that they are ambitious, long and very dynamic works with their own flourish. Both have tonal and extra-tonal elements. Both are dense, ever-mutating collages in sound. 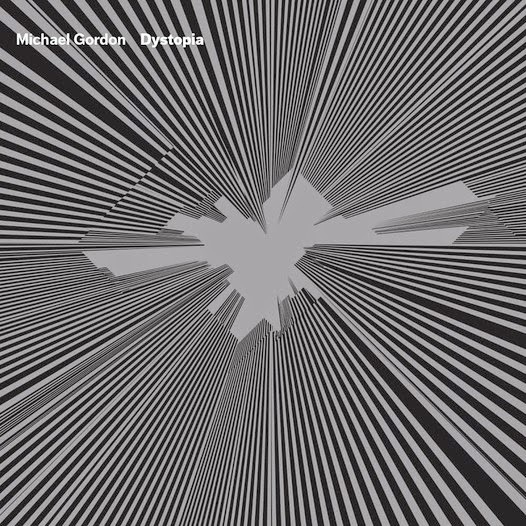 "Dystopia" is the longer of the two, with what sounds like a pretty large orchestra, the Los Angeles Philharmonic under David Robertson. The aim is to capture the essence of Los Angeles, as if one were speeding through it on the freeway at 90 miles per hour. We get a huge cacophony, the sound of glissandi representing a record speeding up and slowing down, with compositional elements that range from Ockeghem to drum-and-bass pentatonic riffs. It is a vast maelstrom of sound that reminds slightly of Charles Ives's last symphony in its thickness and chaos, yet holds its own with distinction and power. The performance is excellent. For the second work Gordon looks to Beethoven's Seventh Symphony for inspiration and commemoration. "Rewriting Beethoven's Seventh Symphony" is the result, played here by the Bamberger Symphoniker under Jonathan Nott. For each analogous movement Gordon has chosen a number of motives from the original, filtered and re-presented in another collage that varies in density but throughout remains multi-thematic and polytonal, multi-dimensional and cacophonous. It is perhaps the slightest bit less daring than "Dystopia" but no less interesting. One's familiarity with Beethoven's Seventh does allow for a bit more recognition of Gordon's compositional transformations at times and for that it should give listeners an insight into Gordon's operational methods. Again, performances are very good. Both works benefit from clear and well-staged audio. 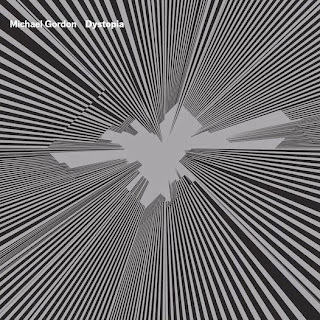 In all Michael Gordon gives us two bold new works that may indeed represent a part of the state-of-the-art today. This is music that must be heard. It is not something to play in the background. Its complexities will allow for extended repeated listenings--and in fact demands them. It all shows us an important composer of today at his best. Essential listening for the new modernism-and-beyond. I have been listening to a contemporary orchestral disk as a download and I don't have a great deal of information to go on as to what it is all about. No matter, because it is worth hearing. 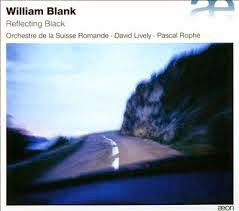 The composer is one William Blank. The album is titled after one of the works, Reflecting Black (Aeon). The Swiss Romande Orchestra under Pascal Rophe do the honors, with David Lively on solo piano. The music is quite evocative in a high modernist mode. "Reflecting Black," "Ebbe(n)" and "Exodes" are sprawling, long-form modernist essays with rather dark-colored orchestration, with in part untempered or quarter tone tuning. All three works are of a piece. One illuminates the other in sequence until, in the end, one has a good idea of William Blank as presented here. The piano part is difficult in a very modern virtuoso way and Lively shows he is up to the challenge with a first-rate reading. This is music that unfolds gradually, darkly, with rapid passages that contrast every so often the long unwindings of the scores. Blank is high modernist without showing influences on his sleeve. He is an original and the music gives us a provocative look at another way to sound avant. It will appeal to those who favor avant garde approaches. The reward is a composer worthy of serious attention and performances that do all to realize the original sounds with precision and flair. 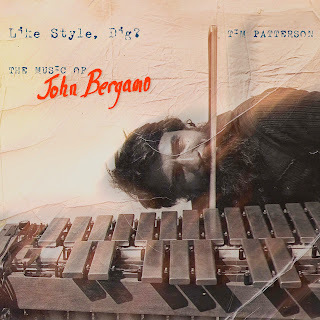 High modernism heralded in the virtuoso percussionist, initially as a part of a section or ensemble and then in the '60s also as a soloist who might perform works unaccompanied. Players like Max Neuhaus set the pace and others soon followed. A body of repertoire for the soloist rapidly developed. 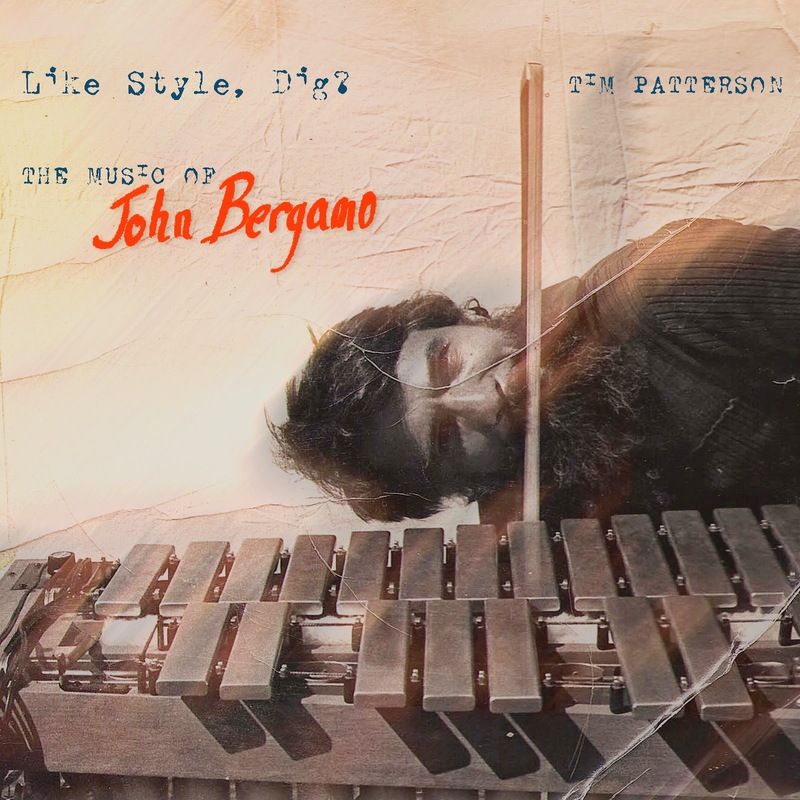 The solo percussion music of John Bergamo from that period lives on in an anthology of works played with great skill and imagination by Tim Patterson. Like Style, Dig? (Innova 899) brings to us six works in one or more movements, four composed in the '60s, one from 1985 and one from 2000. As is characteristic of such solo music, the pieces call upon the percussionist to move rapidly from sound color group to sound color group, often enough via movement from instrument to instrument (pitched or otherwise) as a sort of "one-man band," but also at times concentrating on a single instrument or family, such as the marimba or suspended cymbals. We get to hear Tim Patterson give us his focused, virtuoso take on "Interactions" (1963) for vibraphone and percussion, "Three Pieces for the Winter Solstice" (1968) for solo vibraphone, "Five Miniatures" (1968), "Duets & Solos" (1968), "Blanchard Canyon" (1985) for amplified suspended cymbals, and "Five Short Pieces for Marimba" (2000). The music of the early period understandably follows the sort of asymetrical arcs favored by high modernist style in those days. The later works stray from that paradigm at times. In both cases the music is excellently crafted and inspired. Tim Patterson gives us definitive performances that all who appreciate the sound possibilities inherent in the solo percussion oeuvre will find quite absorbing and worthwhile.